DukeEngage Executive Director, Eric Mlyn, receives traditional Masai Staff from DukeEngage 2017 participants. 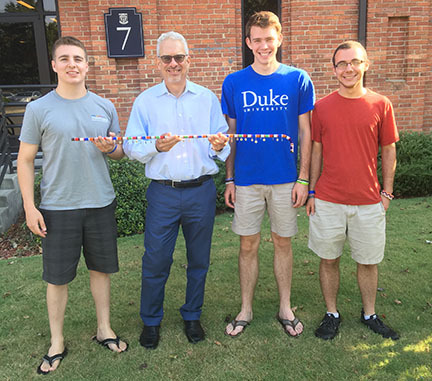 Brian Grasso, Sage Garcia and Matthew Brague presented DukeEngage’s Executive Director, Eric Mlyn, with a Masai Staff after returning from a DukeEngage independent project in Kimana, Kenya, during the summer of 2016. The staff is a symbol of the highest authority in the Masai culture, and the young men were asked by the community to give it to the “male leader” of DukeEngage. The students partnered with Just One Africa and Lenkai Christian School for 10 weeks in the summer of 2016 and worked closely with the community in Kimana on various projects. Read their blog about the summer experience.